Beautifully engraved certificate from the Consolidated Foods Corporation issued in the 1960's. 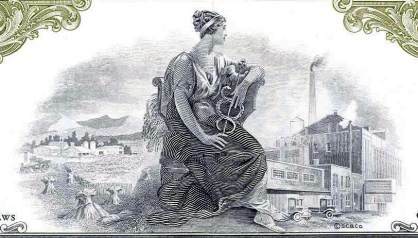 This historic document was printed by the Security-Columbian Banknote Company and has an ornate border around it with a vignette of an allegorical woman in front of a process and distribution facility. This item has the printed signatures of the Company�s President and Secretary and is over 34 years old. 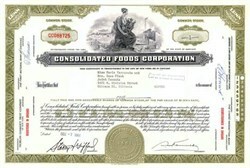 In 1945, the Consolidated Grocers Corporation change their name to Consolidated Foods Corporation to emphasize its diversified role in food processing, packaging and distribution. In 1985, Consolidated Foods changes its name to Sara Lee Corporation. Sara Lee Corporation is a global manufacturer and marketer of high-quality, brand-name products for consumers throughout the world. With headquarters in Chicago, Sara Lee Corporation has operations in 58 countries and markets branded products in more than 180 nations. The corporation employs 141,500 people worldwide.